Blogtown: 2018 Venice Mardi Gras - Wild At Heart! One of the very most fun events in the Venice annual fun calendar is the Venice Mardi Gras Parade, and this year's carousing last Saturday might have topped them all so far! 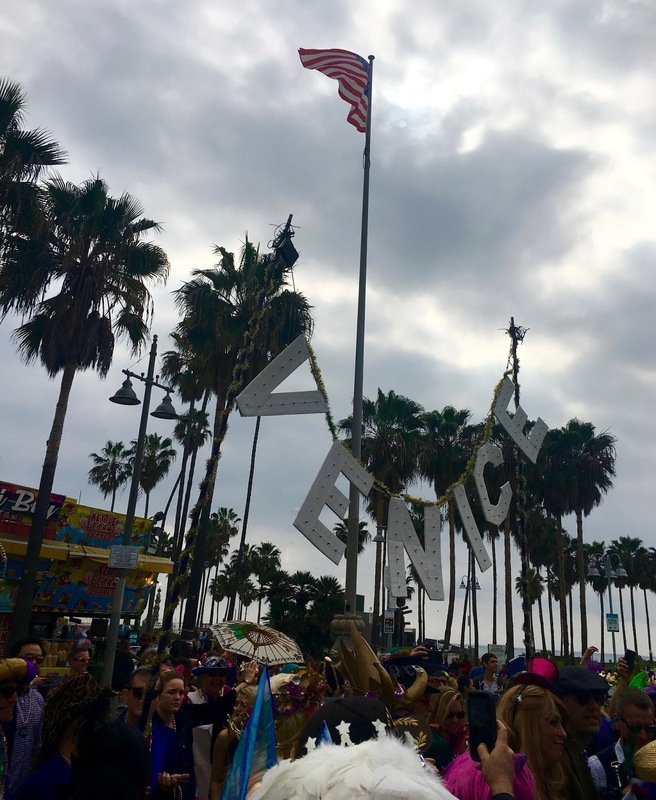 A cloudy day gave way to sunshine - as it can almost be counted on - as the Venice masses assembled for a little pre-parade tailgating in the parking lot at Rose Avenue and the Boardwalk. 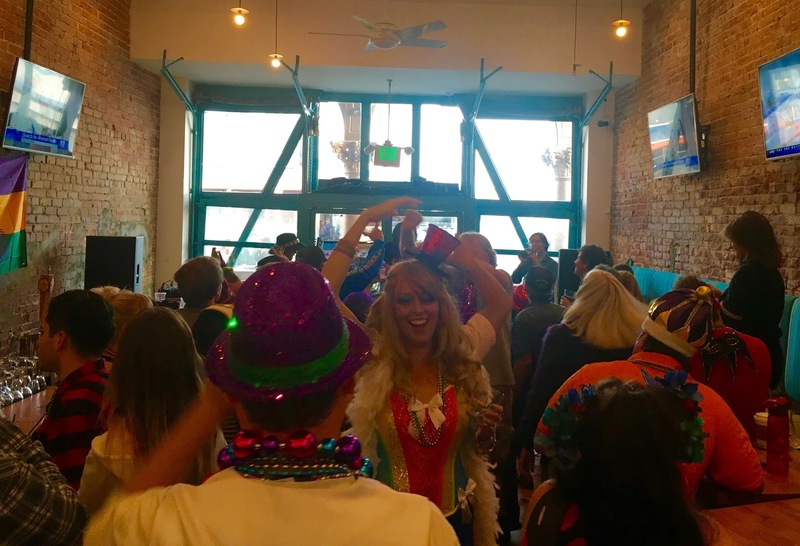 This year's theme was "Wild At Heart" and that vibe was apparent the moment you walked up. People were GOING FOR IT this year. We had to, in the name of humanity, and in the name of Venice FUN. 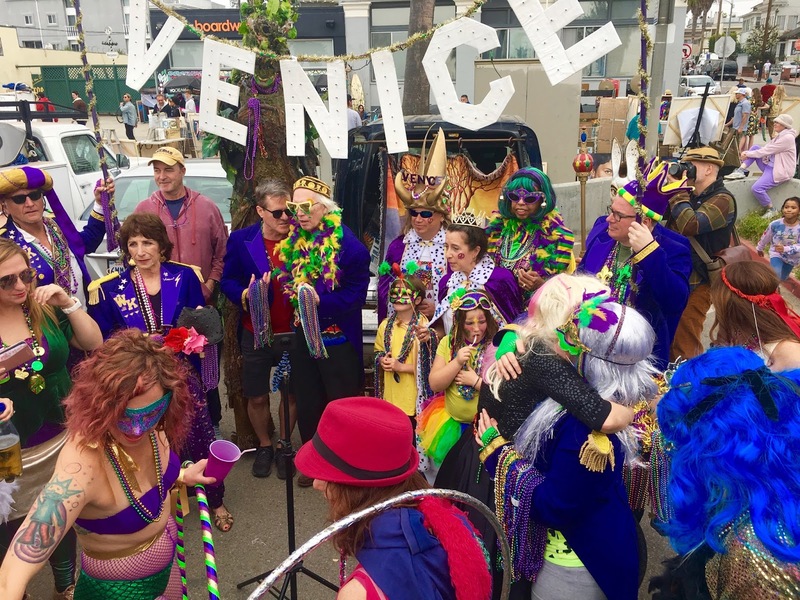 The Krewes of Venice were all there, and the crowd seemed bigger than ever. I think everyone has badly needed to blow off some collective steam, and the folks were ready to throw down for real. It was all on Venice Standard Time, which meant that if the stated time of the parade was to start at noon, we'd probably get rolling at like 1:30 or so ... and that was about right. 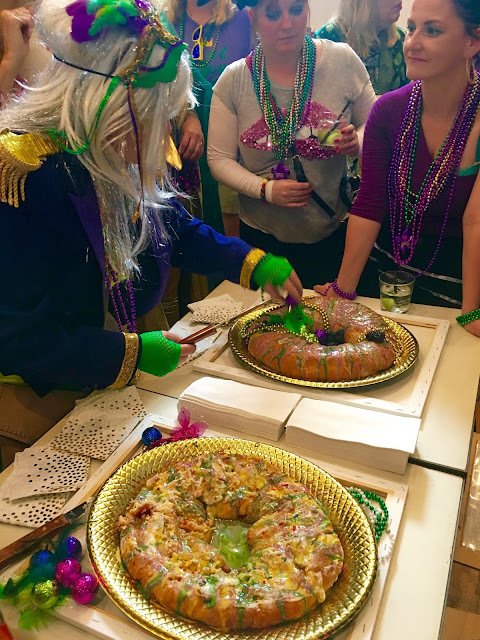 Mardi Gras Queen Colleen Saro and her King Steven Eustace led the shenanigans, and were handing out little pieces of their hearts all day. The moods were high, and all gathered were all about letting our good times roll! 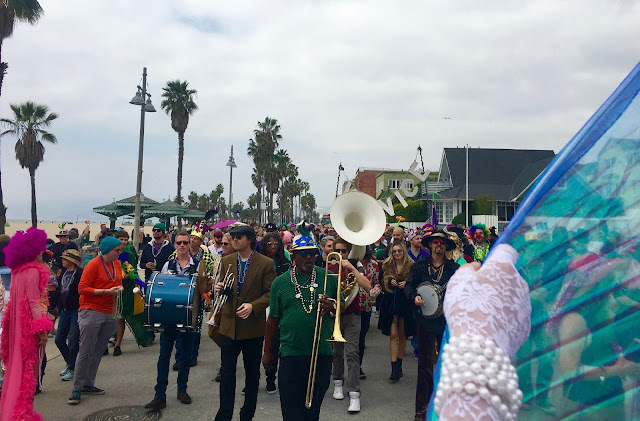 The Gumbo Brothers brass band led the way down the Boardwalk, and - as always - my favorite part of the day, aside from the deep sense of community, tradition, and total blast that it is, is when the unsuspecting tourists watch this cavalcade of joy and festivity go by as a total added bonus to their already awesome day in Venice. It's truly something to behold, and all you see the whole time is ear to ear grins and camera phones raised to try to capture it all. It's really better to just experience it, and remember the feeling in your heart ... because if you were there, you felt it right there. 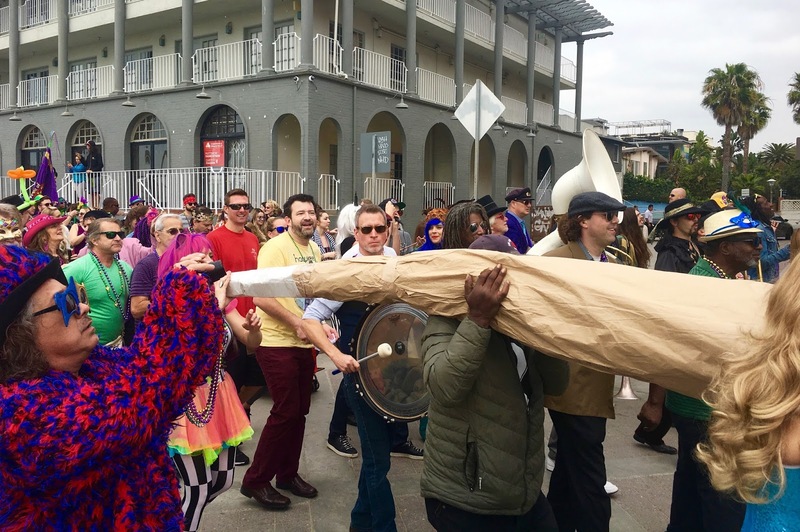 Folks watching from high up windows of Ocean Front Walk apartments blasted off confetti crackers to the cheers of all of us below, and flasks were passed between friends and strangers, as parading is a thirsty affair. One gentleman created a giant J to pass around to the group - legally now, so haha! 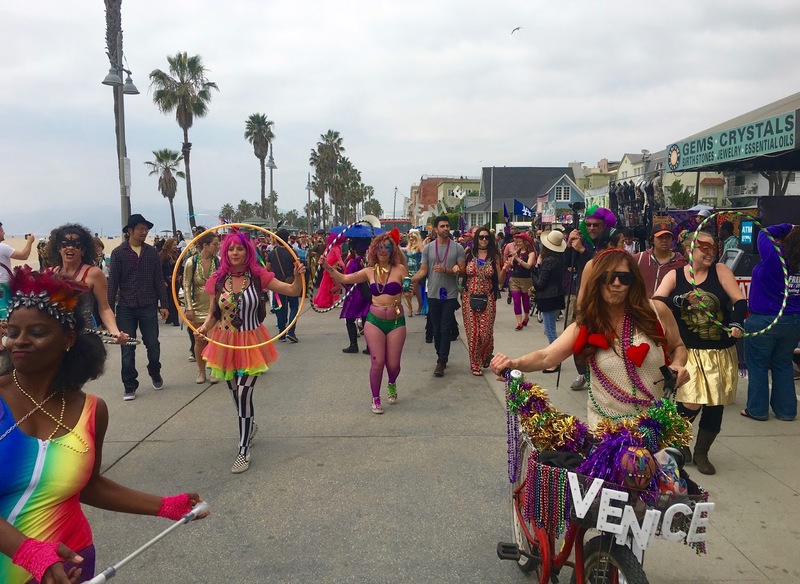 Our local hula-hoopers led the procession to the tune of our brass band brothers, and Gonzo Rock's drum machine bringing up the bass behind. Sidewalk performers played along, with one even packing up his stuff in an instant to join the whole parade, because why not? I was dressed by my dear pal, Suzy Williams, and it was a fun trick and treat to cruise among my people in a blue wig without really being recognized until I said something ... I could get in the habit, actually. There's a certain new freedom in mingling about with total anonymity with people that have known you forever. Try it sometime! You can't really write in words about the feeling of actually being there ... with all your O.G. Venice people, dressed up and showing the whole visiting world what we're really meant to be about. Venice is SUPPOSED to be about the free spirit and the adventurous, wild heart. It's why I chose to move here. It's why anyone did ... until the greed set in and the yupsters came, and think they know what it's about. They don't. 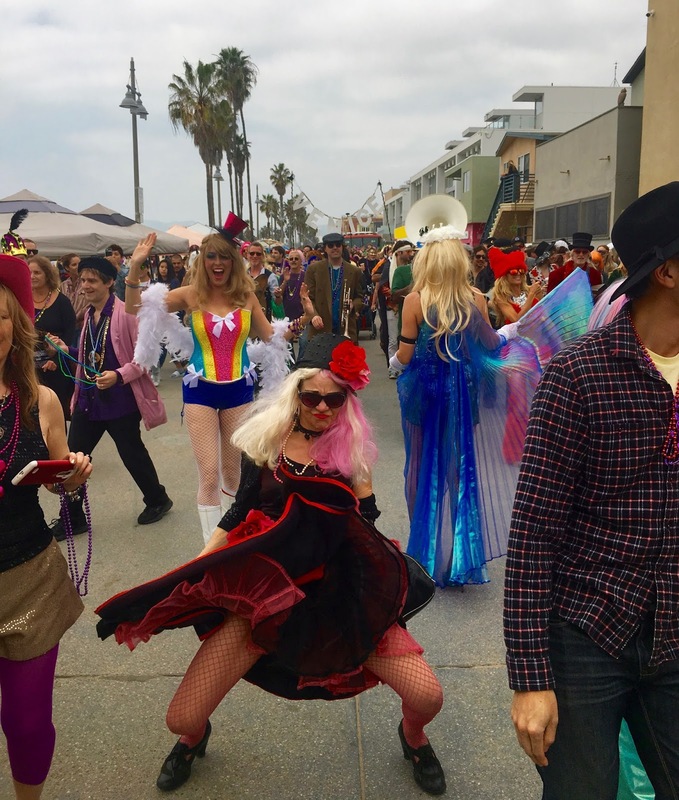 But everyone gathered together yesterday, singing, playing, and dancing our way down the Boardwalk knew. And showed them all. The parade always ends with a jam in the Windward Plaza, and as the Gumbo Brothers got down with the required "When The Saints Go Marching In" New Orleans homage, there was a full-on dance party - and photo opps aplenty (I'm pretty sure we're all about to be featured in a Japanese version of People or something ... LOTS of cameras were out! ), and no end to the fun. 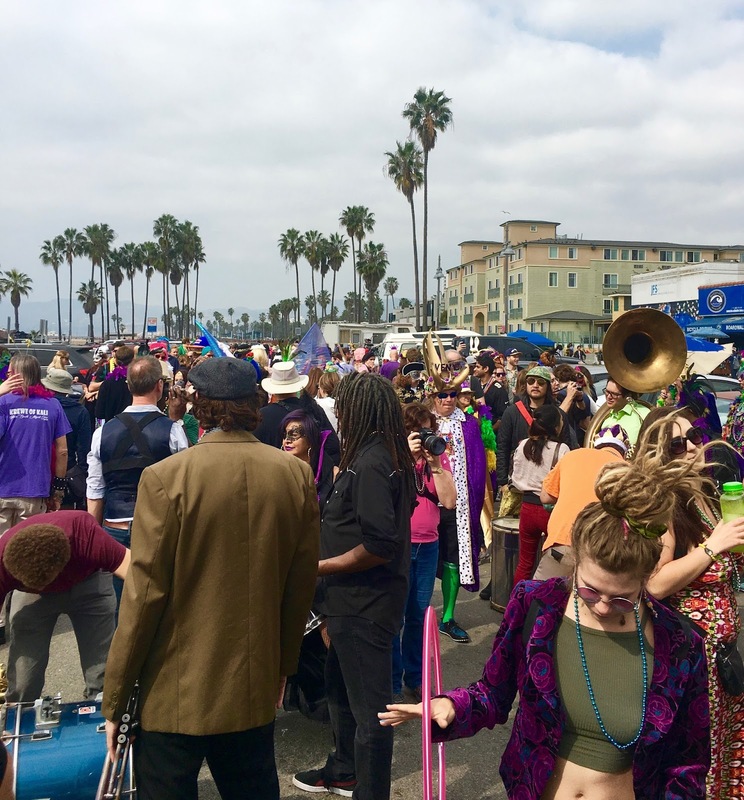 That's because it all turned into the parade PARTY, hosted by Surfside Venice. They had a special menu of Gumbo and Po' Boys, with Abita on tap, and Hurricanes aplenty (Ouch). The Gumbo Brothers were the house band for the day, and the good times just kept on rolling. 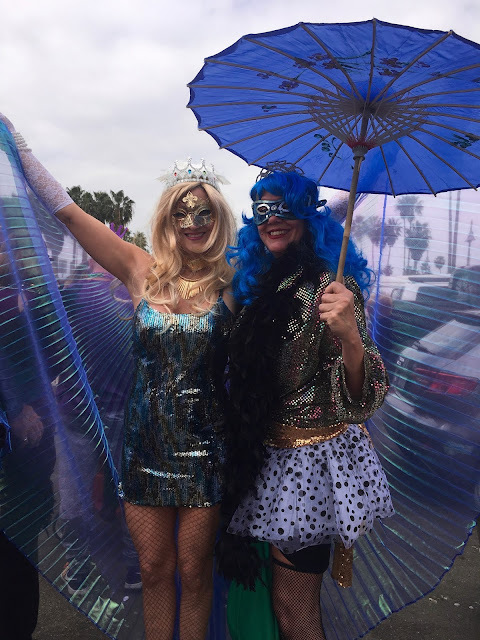 Miss Jessica Long is the ringleader of Venice Mardi Gras, and she was again in fine form this year, in sparkly wings and great voice. 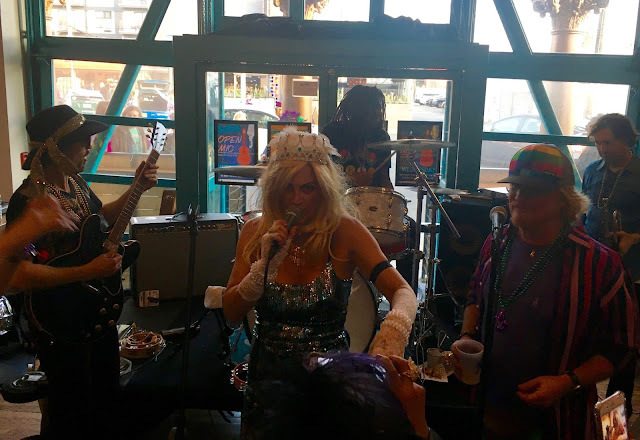 She took lead vocals for a spell, and Marky Lennon (of Venice band fame) backed her up, as if the event needed any more Venice cred. Partiers were dancing so hard that someone's entire dress might have come off ... and no one even blinked. Good times, indeed! ... which might have been why that evening's sunset might have been one of the best ever. Everyone outside stopped what they were doing, and just sat still, watching this giant fuchsia ball of fire sink into the mighty Pacific. There was collective applause for this nightly ritual, but this one felt special on the tail end of this extra-fun day - though we did not see a green flash. Still all good. Mardi Gras Venice People ... you're something else. THANK YOU ALL, because man, did we need that! 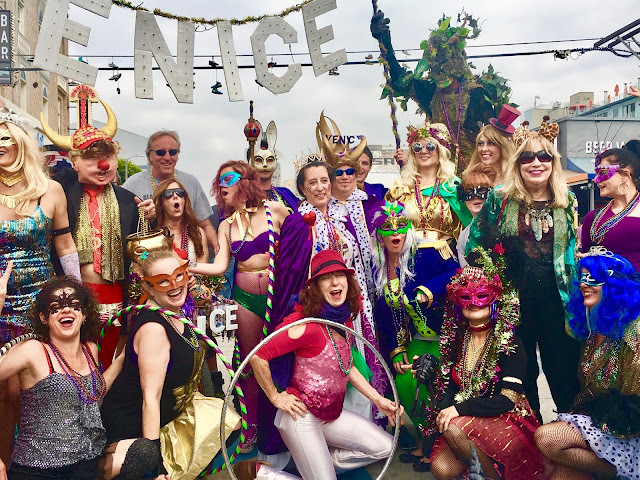 As a town, as a nation, and as a collective group of like-minded, FUN-minded members of our Venice community that KNOW it's still one of the most special places on Earth. It's almost sad, though, because so many people that live here don't even know about it, or if they do, for whatever reason choose not to participate. 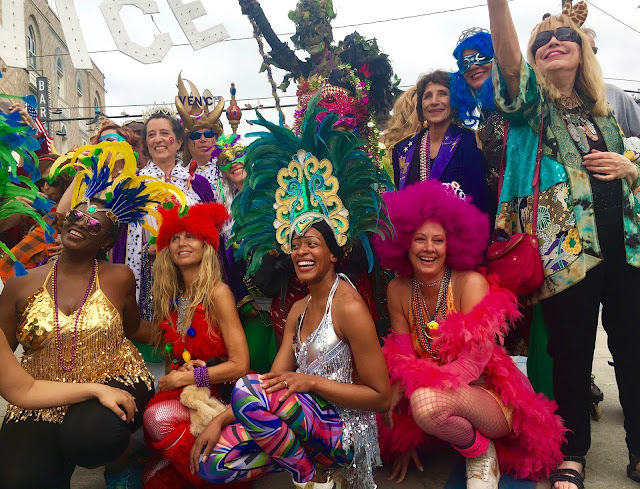 That's on them, and sad for them, because it's one of the very best days of the year in our beautiful neighborhood that was built for just this sort of revelry. Not tech, not BUB people, not Big Little Lies type Moms, No. It was built for the music makers, and the dreamers of dreams by the sea. We who just want freedom to express, to love, and to welcome. And Saturday's Mardi Gras proved that, once again. May our wild hearts prevail ... always. 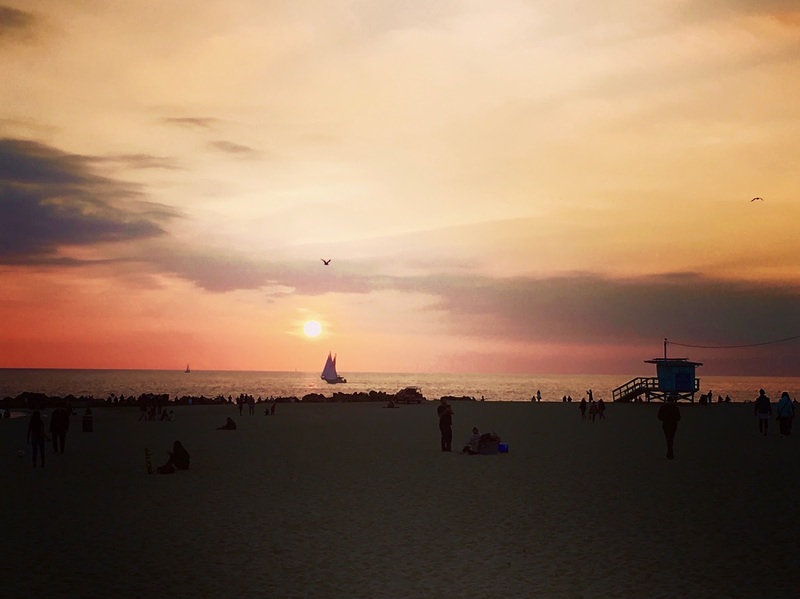 I love you, Venice! *Now while I have you Mardi Gras participants as a captive audience, please consider taking your Spirits of Venice over to the First Baptist Church of Venice (7th and Westminster, across from Oakwood Park) on Sundays (12-3) to show your support and solidarity for preserving Venice history. Learn more about it all this Saturday, February 17th, at the Venice Library. Help keep ALL of our traditions alive!